You can view a grid (thumbnails) of the Adopt-A-Pet cats here. 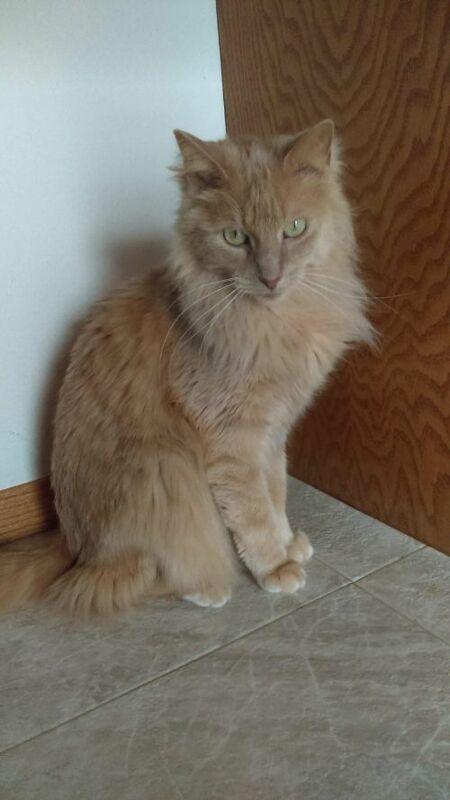 If you are interested in a cat, please send us a message or leave a voicemail at 701-232-5681. Please leave your name, phone number, why you are calling, and the best time to reach you. We try to return messages within 48 hours, but if you don’t hear back from us after 48 hours, please feel free to contact us again. Please keep in mind that voicemail/email is monitored by volunteers and occasionally our schedules may cause some delay in getting back to you. Thank you for your patience. If interested in a pet, please review our Adoption Process. A ‘ ~ ‘ preceding the pet’s name indicates it is a Courtesy Posting . This means that the animal’s owner or person caring for the animal has asked Adopt-A-Pet for assistance in finding a new home for the animal. The animal is currently NOT in an Adopt-A-Pet foster home and Adopt-A-Pet is NOT responsible for the animal. Anna and Tommy were surrendered to our rescue over Easter weekend 2017. One of their owners passed away in April 2016, and the wife was recently hospitalized and is now residing in a nursing home facility. Both were scheduled to be euthanized unless an animal shelter or rescue group agreed to take the pair, as the couple had no adult children or friends to take in their two cats. Anna and Tommy's world has drastically changed, as they are no longer living in familiar surroundings with their humans that they have known their entire lives. They are now settling into their foster home and becoming more relaxed and affectionate. Anna was born in Nov. 2006 and Tommy was born in April 2007, so they are both senior cats that are 10 years old in April 2017. Both cats have had an extensive senior wellness exam with blood work and are current on vaccinations that include rabies, feline distemper and feline leukemia. Both cats tested negative for both feline leukemia and feline immunodeficiency virus. Tommy also had a urinalysis done which was mostly normal with one struvite crystal found. Their blood work results were both normal, with slightly elevated blood glucose (most likely from stress of vet clinic visit) and slightly low BUN (kidney enzyme). Both cats are very overweight and are on a moderate calorie, urinary health prescription diet (Royal Canin S/O). Both cats have some dental disease. with Anna being in more need of dental cleaning. We are looking for a new adoptive or foster home where Anna and Tommy can live together. They have been kept strictly indoors for 10 years, have not been around children or dogs, and ideally should go to a quieter home with no other pets. Tommy is the more outgoing and friendly cat of the pair whereas Anna is more cautious, but both enjoy pets and chin scratches. Audi is a neutered male with medium-length hair who is buff in color. He was born on Aug. 23, 2016. Audi, his two siblings and his mother Topaz were transferred to our rescue from another rescue in north-central North Dakota. Audi is named after a high-performance race car as he and his sister have two speeds--off and overdrive. 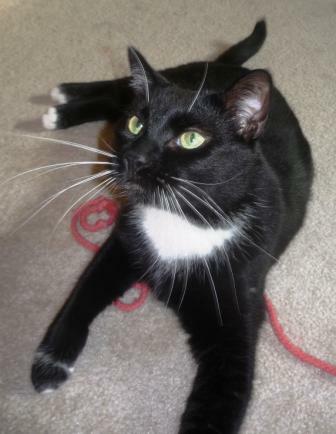 Audi is energetic, affectionate, playful and a very boisterous young boy. He likes to climb humans and perch on their shoulders where he can supervise the human activity. Audi is fascinated with running water--the flushing toilet, the shower, and washing dishes in the sink. He will put both paws in the water bowl when he drinks, and he has taken drinks with his paw like a raccoon. Audi has been dewormed, received three feline distemper and feline leukemia vaccinations, and his 1-year rabies vaccination. Audi had a sibling who tested positive for feline leukemia, but Audi has tested negative for feline leukemia at 8 weeks of age and again at 6 months of age. Misty is a shorthaired, brown/white tabby spayed cat who turned one year old in April 2017. Misty was rescued from a a local trailer park in July 2016. Initially, she was fearful of being inside a home and suspicious of humans, but she soon realized that shelter, food, water and care are constant in her foster home. Her favorite toy is the Da Bird wand toy, as that was the toy used to entice her out of hiding in the cat tree when she first arrived in her foster home. It took a few weeks before Misty adapted to the other cats in the foster home and to the lab mix dog. Misty likes to snuggle up to older cats and get groomed and nurtured by them. Misty is timid and still gaining confidence, so she would do best in a home with another cat. She has not been around young children. Misty is negative for feline leukemia and feline immunodeficiency virus,current on feline distemper and rabies vaccinations, and microchipped. She is litter box trained. 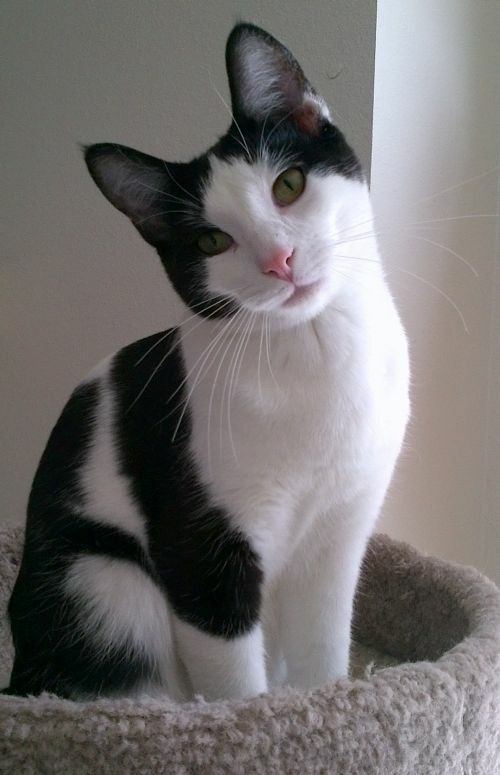 Sundance is a black and white, domestic short-haired, neutered adult male cat. He and his brother "Solstice" were born in a Fargo area pound on the summer solstice in June 2012. He will turn 2 years old in June 2014 and weighs a little over 9 pounds. Sundance has a long, lean body and an extremely long tail. Sundance has become a more confident cat and will bring a cat-nipped filled, plush ball to play fetch. Sundance needs to initiate the game and is good for about 5 tosses. He has adjusted to the dog in his foster home. Sundance enjoys rough-and-tumble wrestling matches with his brother Solstice, and enjoys chasing the red laser light dot. Sundance is more of a "leaner" than a lap cat, as he likes to lean against your leg if you are sitting up in bed or lounging on the couch. He can be fairly vocal when he wants his food. Sundance is FIV and feline leukemia negative, up-to-date on vaccinations and microchipped. Topaz is a spayed female with short hair who is about two years old. She has tortoiseshell-brown tabby markings and came to Adopt A Pet with her three kittens.She is playful and affectionate. 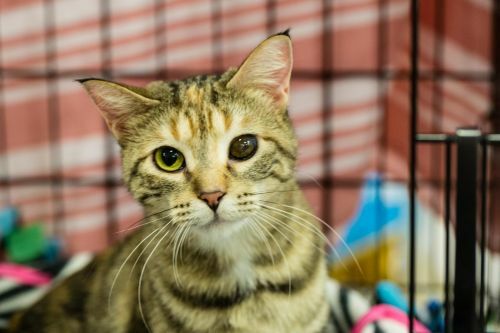 Topaz has different colored eyes, and her left eye has pigments deposited on her corneal surface that give the eye surface a rough and pitted appearance. The veterinary ophthalmologist believes that Topaz received an injury to her left eye at birth or shortly thereafter, but her eye is not painful. Topaz is a very petite kitty and looks a lot like her daughter, Porsche, in size and coloring. Topaz is a little nervous around dogs, especially if they are barking, and is a bit scared at Petco adoption events. Topaz has been dewormed and has received two feline distemper/leukemia vaccinations and a rabies vaccination. Topaz had a son who tested positive for feline leukemia, but Topaz has tested negative for feline leukemia on three separate occasions.